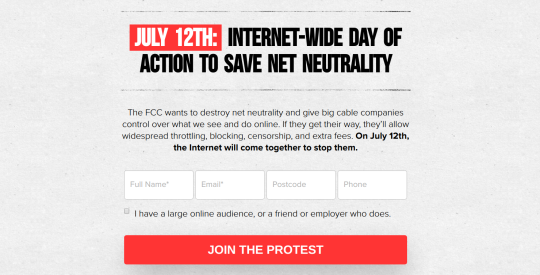 Urban Dictionary, Bandcamp, Automattic (who run WordPress) and Discord are among latest major web platforms to join the Internet-Wide Day of Action to Save Net Neutrality scheduled for July 12th to oppose the FCC’s plan to slash Title II, the legal foundation for net neutrality rules that protect online free speech and innovation. Twitter, Reddit, Netflix, Amazon, Kickstarter, Etsy, Vimeo, Private Internet Access, Mozilla, OK Cupid, Imgur, PornHub, Medium, and dozens of other major sites are also participating. More than 50,000 people, sites, and organizations have signed on to the effort overall, and more announcements from major companies are expected in the coming days. Participants will display prominent messages on their homepages on July 12 or encourage users to take action in other ways, using push notifications, videos, social media, and emails. The effort is led by many of the grassroots groups behind the largest online protests in history including the SOPA blackout and the Internet Slowdown. The day of action will focus on grassroots mobilization, with public interest groups activating their members and major web platforms providing their visitors with tools to contact Congress and the FCC. Other sites and apps participating include Soundcloud, Medium, Y Combinator, GitHub, Pantheon, Bittorrent Inc., Shapeways, Nextdoor, Stack Overflow, Funny Or Die, Dreamhost, and CREDO Mobile, Goldenfrog, Fark, Chess.com, Namecheap, DuckDuckGo, Checkout.com, Sonic, Ting, ProtonMail, O’Reilly Media, SlashDot, Dribble, Dischord, SourceForge, and Union Square Ventures. Organizations participating include Fight for the Future, Free Press Action Fund, Demand Progress, Center for Media Justice, EFF, Internet Association, Internet Archive, World Wide Web Foundation, Creative Commons, National Hispanic Media Coalition, Greenpeace, Common Cause, ACLU, Rock the Vote, American Library Association, Daily Kos, OpenMedia, The Nation, PCCC, MoveOn, OFA, Public Knowledge, OTI, Color of Change, MoveOn, Free Software Foundation, Internet Creators Guild, the Women’s March, and many others.